February | 2010 | E-verything! Our recorded Edublogs Webinar a couple of days ago was presented by guest presenter Shelly Terrell (Shelly is @ShellTerrell on Twitter). She is well known as an active educational collaborator and social media user, she uses a variety of Firefox Add-ons to help her manage the huge amount of information that crosses her screen every day. This was a fantastic session! 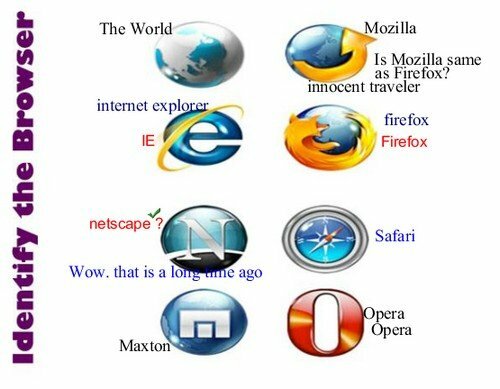 Shelly kept us engaged throughout with a range of interactions including this one early in the session when she was finding out about our “browsing” background knowledge and asked us to name some browsers from their icons. There was a lot of discussion in text chat throughout (sharing information about browsers and favourite add-ons) as well as the activities and Shelly’s answers to numerous questions. Shelly shared her desktop to demonstrate installing an add-on and we also had a desktop share from one of our participants using a different browser. All of this made for a very lively session. You really need to catch the recording for the ful flavour as just writing a post about it is very one-dimensional in comparison the multi-dimensional feel of the session. Join us on Thursday February 4th at 23:00 GMT (6pm USA EST, Midnight CET) or Friday February 5th at 7am West Aus, 10am NSW, depending on your timezone – in the usual Elluminate room. 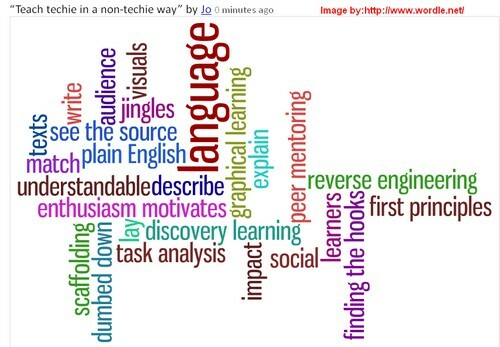 The topic chosen in Edublogs Serendipity Webinar this week was “Teaching technical subjects in a non-technical way”. 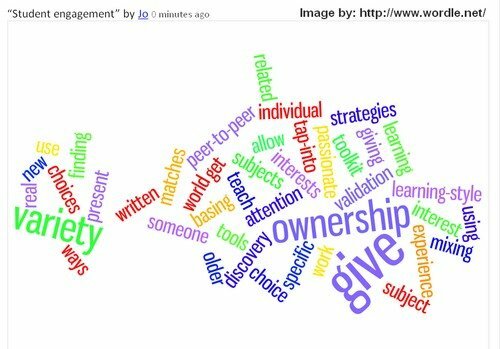 This generated a really interesting discussion with many great ideas expressed in text, on the whiteboard and over audio, Catch up with the recording for all the details – the Wordle below gives a flavour of the discussion. Our next Webinar is an Edublogs “Techie How To!” session “Add-on Value to Firefox” by guest presenter Shelly Terrell, Shelly (technology teacher, trainer and social media consultant) will explore some of her most valued Firefox add-ons. Join us on Thursday February 25th at 23:00 GMT (6pm USA EST, Midnight CET) or Friday February 26th at 7am West Aus, 10am NSW, depending on your timezone – in the usual Elluminate room. We had an interesting issue before we started the most recent Edublogs webinar “Teach to the Test?” in that we were “hijacked” by at least two and more likely three or more quite disruptive children (or at least they purported to be, and sounded like, children). One gave “her” age as “seven” and another gave hers as “ten”, at least one of them seemed to be using an alias and also logged in at one point as “KILLLER”. Luckily we identified and dealt with this largely before the session started and were also ready for any additional invasions during the session. This sort of occurrence gives food for thought and raises some questions. For me my main thought was about how several children had got the link on this occasion when this has not happened in any of our sessions before. The link is posted in a variety of places (three events calendars) and is also Tweeted out (and often retweeted) several times just prior to the session. So perhaps it is surprising that this has not happened before rather than surprising that it happened at all. The voices were very “young sounding” and in my opinion the accents were North American. I have a concern that these quite young children apparently had sufficient access to enable them to join a live adult session with no supervision and that this could pose a risk to them in the future. Would you recognise/identify non-appropriate participants? How would you deal with them and with behaviour that disrupted the session? It was something I was already very well aware of as a possiblity because some of my students are “Youth at Risk” and may have behavioural issues that manifest in face-to-face situations. So I had already thought of some strategies for identifying and managing potential problems of this type when thinking of transferring some of these students to an online context. Thankfully Elluminate has some features that make it a bit easier to deal with issues of this kind (look out for a post on this soon). Moderator control over access to tools is very useful and as a moderator it is also possible to remove someone from a session, although unless you block access to all new participants you can’t stop them joining again. Blocking access to all is not an option for me because we have people joining throughout sessions. This might be something for Elluminate to consider – perhaps when someone at a particular IP address is removed then to not allow that IP address to rejoin for 2-3 hours. Identifying that these participants were not really appropriate was probably relatively easy in this case because two of them were in the room very early and were talking at times. Also one had started video with the camera pointing at their body rather than their head. On hearing the voices I was alerted as they sounded very young. I removed video access and then spoke to them but did not get a proper response. They then started to draw on the whiteboard, my instant response was to remove their access to whiteboard tools and to say this was because we were loading the presentation. I had no wish to offend legitimate participants who were just experimenting because I am happy for people to do this. The immediate response was variations (in audio and text) around a theme of asking/demanding to be allowed to draw with one very rude response to the effect that “you must die!” (if you don’t let me draw). I then removed audio permission. At this point we were joined by Shelly Terrell who has Elluminate experience. I told her of the situation – we agreed that the children should be removed. I did this and then gave Shelly moderator status to help me deal with any further issues. She provided fantastic support for the rest of the session, when we again had these or other children joining. As a further strategy for monitoring and identifying any children I was then a liittle more pro-active than usual in encouraging participants to tell us about themselves and what they did either in text or by audio. We had one apparent child who remained quiet and to whom we gave the benefit of the doubt – ie we didn’t remove her because she was causing no issues. She chose to leave on the basis that the session was for “grown ups” and a bit weird so she would like to find one for “kids”. Please comment as I would love to hear your thoughts and ideas on any aspect of this post. Edublogs Webinar – Teach to the Test? Wow! This was a session with a buzz! The Teaching to the test vs teaching to the learner’s needs debate is one of those perennial topics that always gives rise to a terrific discussion. Made even better by @philhart’s excellent facilitation, you should definitely catch the recording! I don’t think Phil will mind me saying that he was a bit nervous. We have co-facilitated lots of times but usually with myself as lead doing most of the talking or in “Techie How To!” sessions where we took a section each. This was the first time that Phil had initiated and facilitated a discussion session, and in my possibly biased opinion he did a great job! Phil has already posted about his feelings on the session so it falls to me to give a bit of an overview. The session included several polls and lots of whiteboard brainstorming, this combined with the strong contributions through text chat and audio made for a highly interactive session. Whiteboards with stimulus questions were quickly filled with thoughts and ideas with the pace maintained by using the timer. This is not really the place to put up all those whiteboards but to whet your appetite for the recording I have made a Wordle for one of them. 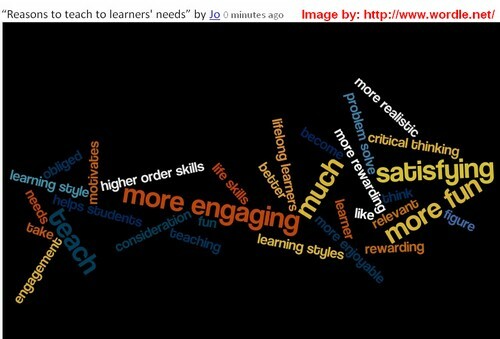 The question was looking for personal reasons for teaching to learners’needs. Feedback at the end was very positive and everyone seemed to enjoy the session immensely. Join us here in Elluminate on Thursday February 18th at 23:00 GMT (6pm USA EST, Midnight CET) or Friday February 19th at 7am West Aus, 10am NSW, depending on your timezone. As always a wide variety of ideas were shared during the discussion using a blend of audio, text chat and whiteboard – checkout the recording for the full flavour!. There were a lot of great contributions on the whiteboard (sometimes conversation is more in the text and it’s always exciting to get a full whiteboard) so I thought it would be interesting to create a Wordle from them! There were several suggestions that we further explore the topic of engagement in different contexts particularly maths. Most of the participants had some involvement in maths at some level and I think all of us in that position have hit the proverbial “brick wall” with engagement in maths at some point. So look out for a “Talk Time” discussion or a “Tools and Strategies” sharing session on Student Engagement in the not too distant future!